How can I buy in the Martin Drive Neighborhood? The Martin Drive Neighborhood is affordable, diverse and has a great location. For more reasons why you should buy in Martin Drive, see our presentation! STRONG Homes Loan Program - One highlight of the 2015 City Budget was the creation of the STRONG Homes Loan Program. This new program will assist current homeowners to make essential home repairs and abate code violations at their properties. Eligible items include replacing a roof, replacing a failing porch, repairing or replacing deteriorating siding or failing exterior paint, and correcting hazardous conditions or building code violations. If a homeowner remains in their home for ten years after the completion of the work, 25% of the STRONG Homes loan will be forgiven. Are you interested in purchasing and fixing up a City-owned home? 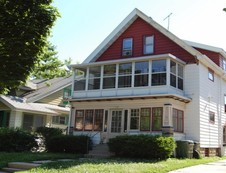 As part of Mayor Barrett’s STRONG Neighborhoods Plan, the City of Milwaukee’s Neighborhood Improvement Development Corporation (NIDC) is providing fully forgivable loans of up to $20,000 to assist owner-occupant buyers with the rehabilitation of City-owned foreclosed homes. The Homebuyer Assistance Program is available throughout the City of Milwaukee, is not limited to first time homebuyers, and has no maximum income limits for qualification. As part of the program, applicants are provided free technical assistance to help with scope of work development, soliciting bids from licensed contractors, and monitoring rehabilitation. HARP - If you're not behind on your mortgage payments but have been unable to get traditional refinancing because the value of your home has declined, you may be eligible to refinance through the Home Affordable Refinance Program (HARP). HARP is designed to help you get a new, more affordable, more stable mortgage. HARP refinance loans require a loan application and underwriting process, and refinance fees will apply. Click here for more information. ​​City of Milwaukee - The City of Milwaukee, through NIDC, works with works with City departments, community-based agencies, financial institutions, developers, local foundations, and most importantly, residents, to improve Milwaukee's neighborhoods. ​​Visit www.milwaukeehousinghelp.org to learn more about current programs. Housing Resources Inc. - Housing Resources Incorporated (HRI) is a nonprofit organization dedicated to helping individuals and families purchase their own homes. Click here to learn more! Select Milwaukee - Our mission is to help people achieve and maintain homeownership because it enriches their lives and strengthens neighborhoods and communities. A trusted nonprofit resource for homeownership services since 1991, we’re advocates and experienced homeownership professionals serving home buyers and home owners. Check out their website! ACTS Housing - Our work enabling low-income homeownership for the last 20 years proves that homeownership is possible and transformative for families even in Milwaukee’s most challenged neighborhoods. Each year, ACTS helps over 100 families buy and rehab their own homes. Take a look! Focus on Energy - Focus on Energy helps Wisconsin residents lower their energy consumption and costs by making their homes more energy efficient.​​ Need a new furnace? Buying a heating system and air conditioner at the same time? Tired of ice dams or cold rooms? The Residential Rewards Program offers Cash-Back Rewards for heating and cooling equipment as well as attic insulation and air sealing. Enhanced Rewards are available for heating and cooling equipment for income-qualified participants. Improve your house and save money -- learn more here! Milwaukee County Transit System - Find your bus route here! Find out where to vote and who your elected officials are, and their websites. The Martin Drive Neighborhood works closely with real estate Broker Brad Posnanski, who grew up in the neighborhood and whose parents still live here. Ask Brad about buying today! Call or email Pat Mueller today with any questions; 414.339.2099 or pmueller4502@gmail.com.